Sruighlea (e gouezeleg, distaget [ˈs̪t̪ruʝlə]), Stirling (e saozneg, distaget [ˈstʌrliŋ]), a zo ur gêr eus Bro-Skos, war lez ar Forth, ha pennlec'h ar c'huzulva anvet heñvel. Brudet eo he c'hastell. E 2008, e oa 38 700 a dud o chom e kêr, ha gant kêrioù kenstok, Bannockburn ha kêr vihan Bridge of Allan, ouzhpenn 45 750 a dud. 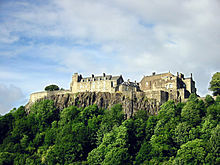 ↑ Stirling to become first UK city in more than 10 years to link with Turkey. BBC News (8 a viz Ebrel 2013). Kavet : 12 a viz Mae 2013. Kemmoù diwezhañ degaset d'ar bajenn-mañ d'an 6 Gwe 2018, da 05:38.